No method exists for accurately determining the age of a turtle. Some species provide clues via the rings on their shells, but many species, such as soft-shell turtles (Apalone sp.) and sea turtles, have no rings to consult at all. 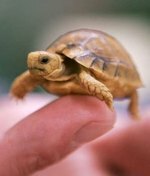 Accordingly, you can only make educated guesses about a turtle's age unless you know the approximate date the turtle hatched. Two turtles siting on a rock. Many turtles, especially tortoises and box turtles (Terrapene sp. ), possess distinct rings on their plastrons -- the part of their shells that protect their undersides. However, unlike trees, turtles do not necessarily produce their rings annually. They may produce extra rings in times of abundant food or may fail to produce rings in years in which they were injured, ill or unable to find enough food. Additionally, as turtles drag their plastrons on all types of abrasive surfaces, the rings often erode and become indistinguishable by the time a turtle reaches about 20 years of age. In many species, the rings are difficult to identify, creating other problems with this strategy. You can draw a few tentative conclusions about the general age of some turtles by examining their shells' condition and color. For example, when considering wild-caught individuals, older turtles will show more evidence of wear and tear. Their plastrons will be smooth, their carapaces may have several dents or chips, and they may have scars on their legs or heads. While such clues do not indicate exact age, they allow you to make the reasonable conclusion that a specimen is an adult, which is to say 10 to 20 years of age or more. Captive-raised turtles are unlikely to have sustained the shell damage that their wild counterparts have, making shell damage an unhelpful criterion. Additionally, some turtles tend to darken with increasing age, while others lose distinctive patterning. While not a technique available to the average turtle keeper, some scientists have begun examining the bones of sea turtles -- a discipline known as skeletochronology -- to determine their ages. Some bones are thought to produce annual rings, so by analyzing them, and counting these rings, scientists should be able to determine their ages. However, according to Dr. Brian Wallace of the nonprofit sea turtle conservation organization The State of the World's Sea Turtles, the investigations have produced mixed results. Wallace explains that the technique works well with some species, such as Kemp's ridley sea turtles (Lepidochelys kempii), but not others, such as leatherback sea turtles (Dermochelys coriacea). One of the reasons that scientists are interested in determining turtles' ages is because turtles live such long lives. While box turtles and slider turtles may reach 50 years of age or so, some of the giant tortoises live much longer lives. Scientists suspect that the world's most famous tortoise, a Galapagos tortoise (Chelonoidis nigra abingdonii) named Lonesome George, was approximately 100 years old at the time of his death. In 2014, the BBC reported that one turtle -- a Seychelles tortoise (Aldabrachelys gigantea) named Jonathan, who currently lives as a pet on the island of St Helena -- is thought to be 182 years of age.